Product prices and availability are accurate as of 2019-04-05 18:32:40 EDT and are subject to change. Any price and availability information displayed on http://www.amazon.com/ at the time of purchase will apply to the purchase of this product. 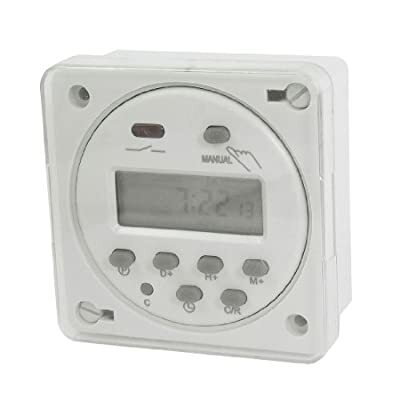 Features: Panel mounted, advanced pre-setting one week before, digital electronic timer switch with daily programs, repeat programs with 17 on/off setting and manual over-ride, auto timer error correction +- 30 sec, weekly.Please Note:this product can not directly control high current, please use some SSR AC Contactor if you want to control heating element or other high current load.